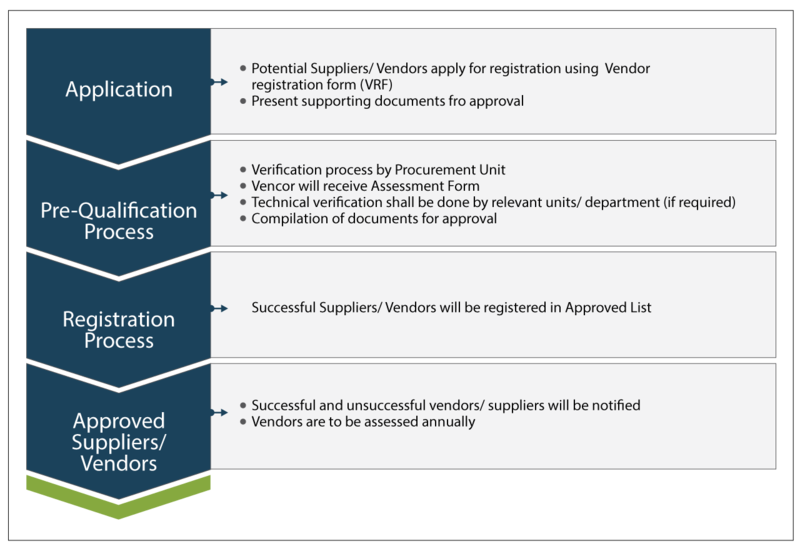 Procurement is responsible to educate and assisting relevant unit/department for the purchasing on Supply, Works or Services and ensuring compliance to Company's Procurement Policy and Procedures. 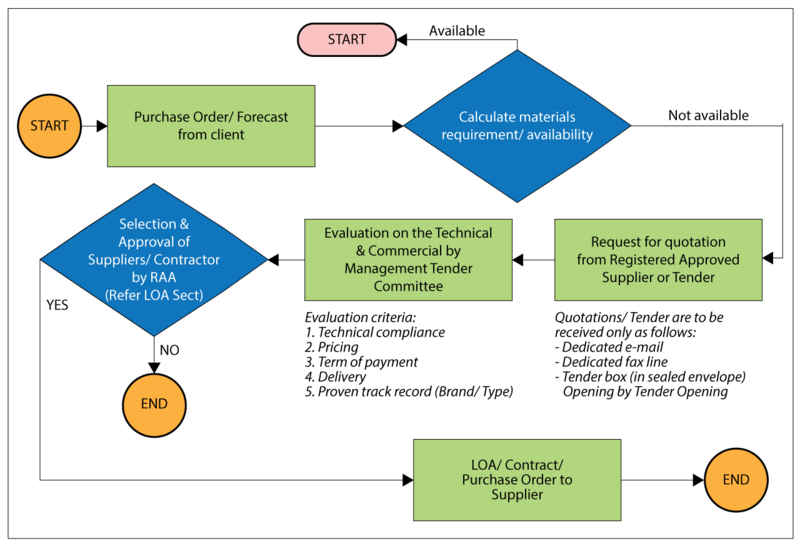 Procurement Policy and Procedures document has been developed to establish the procurement process for Tenaga Switchgear Sdn. Bhd. (TSG). The objectives of the Procurement Policy and Procedures are to implement best business practices, increase corporate transparency, enhance corporate governance in line in support of improving operational efficiency, customer satisfaction and increase profitability. Company Procurement Policy and Procedures shall be aligned to Company's overall business priorities and development agenda. The policy and procedures shall incorporate best business practices for achieving best value, fair competition and optimum participation; and good corporate governance. - To implement best business practices, increase corporate transparency, enhance corporate governance; and develop a robust and competitive among the Supplier / Vendor. To ensure that the procurement of and tendering for goods and services are properly authorised, recorded and monitored. To ensure that the purchased goods and services are a satisfactory quality and offer value for money. To minimise the chances of misappropriation and protect Skill set and its staff in such an event. TSG is committed to providing reliable and quality product in High Voltage Switchgear industry. We are also committed to maintaining the highest degree of integrity and in a social and environmentally responsible manner in all our dealings with potential, current and past clients. This Supplier Code of Practice defines the basic requirements placed on TSG's suppliers of goods and services. TSG expectation is that the supplier will lawfully conduct their business with the same standards of integrity and ethical behavior and comply with TSG's code. Compliance (including our agents, suppliers or sub-contractors) with all applicable legal laws which includes any rule regulation and by-laws and shall indemnity and hold TSG safe and harmless against all claims, demands, losses, fines and penalties which in any way result from us failure to comply with such applicable law. Contract will usually be in the form of a proposal, including objectives, activities, costs, timescales and deliverables. The quality of our service and the value of our support provide the only true basis for continuity. We always try to meet TSG contractual requirements, and particularly for situations where an external funding provider requires more official parameters and controls. Committed to maintaining the highest degree of integrity in all dealings with TSG, both in terms of commercial confidentiality and the protection of all information received in the course of providing the business services concerned. We extend the same standards to all our vendors, suppliers and associates. Conduct all of our activities professionally and with integrity. We take great care to be completely objective in our judgement and any recommendations that we give, so that issues are never influenced by anything other than the best and proper interests of our clients. Maintain the quality of our product through constant ongoing review with TSG's team, of all aims, activities, outcomes and the cost-effectiveness. We encourage regular review meetings and provide regular progress reports. Further details are available on request. We are providing the best value to TSG, our commitment to providing our excellent goods and services. We consider the safety and quality of our products to be of paramount importance and to comply with government, TSG and company safety requirements and specifications at all times. Flexible as possible in the way that our services are charged. We make no attempt to charge interest on late payments, so we expect payments to be made when agreed. Use reasonable efforts to promote among our suppliers compliance with this Code of Conduct and we committed to comply with the principles of non-discrimination with regards to supplier selection and treatment. No employment workers under the age of 15, in those countries subject to the developing country exception of ILO Convention 138, to employ no workers under the age of fourteen (14). » makes continuous efforts to achieve a workplace that is free from work-related injuries and illnesses. Tenaga Switchgear Sdn. Bhd. considers environmental management to be of prime importance and is fully committed to fulfilling all environmental responsibilities as well as continuous improvement of environmental performance. As such Tenaga Switchgear Sdn. Bhd. will work with clients, sub-contractors, suppliers and the workforce towards achieving this goal. This procedure highlights the safe working practices required for all contractors working at TSG or site . It is intended to improve safety performance and to ensure the safety of contract employees as well as the employees at TSG or site. 2.1 The safety practices shall be followed whenever performing work at TSG or site. 2.2 The contractor shall require that all subcontractors observe the safety practices in the same manner as the contractor. 2.3 All contractors shall designate a Supervisor who shall have the primary responsibility for ensuring that these safety practices and procedures are followed. 2.4 The Supervisor, or designated authority, shall perform frequent and regular safety inspections of the job site, materials, and equipment. 3.2 Hearing protective devices must be worn when working in areas that require hearing protection based on noise level monitoring or when performing a task that produces high noise levels. Areas where hearing protection is required are marked with appropriate signs. 3.3 Appropriate hand protection shall be worn to protect against chemical contact , severe cuts or lacerations, punctures, or harmful temperature extremes. Chemical resistant gloves must be rated/compatible for the specific chemical being used. 3.4 Safety helmet or Bump Caps, meeting the safety requirements, are required whenever there is a potential for injury to the head from falling objects or striking a low overhead structure. When working with overhead crane, wearing safety helmet is compulsory and bump caps is not allowed. Green line in production area is free from wearing safety helmet. Foot protection, meeting the safety requirements shall be worn when there is a danger of foot injuries due to falling or rolling objects or objects piercing the sole ( production area, logistic and store and when doing construction work in TSG premise. 3.1 Safety glasses meeting the safety requirements must be worn at all times when there is an eye hazard from exposure to flying particles, liquid chemicals, acids or caustic liquids, or potentially injurious light radiation. Safety glasses are required to be worn while working in TSG areas. Activities requiring eye protection include: welding, cutting, burning, using pneumatic impact tools, grinding, buffing, using hand-tools, applying or removing insulation, and painting. 3.4 Safety helmet or Bump Caps, meeting the safety requirements, are required whenever there is a potential for injury to the head from falling objects or striking a low overhead structure. When working with overhead crane, wearing safety helmet is compulsory and bump caps isnot allowed. Green line in production area is free from wearing safety helmet. Foot protection, meeting the safety requirements shall be worn when there is a danger of foot injuries due to falling or rolling objects or objects piercing the sole ( production area, logistic and stor and when doing contruction work in TSG premise. 3.5 Respiratory protection, must be appropriate for the hazard and must be maintained, cleaned and stored properly. All persons wearing respirators must be medically approved to do so and fit-tested. (refer to MSDS/CSDS for more information type of respiratory to use). 3.6 Horseplay is not tolerated. Smoking is allowed in designated areas only. 3.7 Drinking of, or possession of, alcoholic beverages, or possession of illicit drugs or firearms while on the property of this facility, during working or non-working hours, is strictly forbidden. 3.8 Entry into confined spaces may only be performed by authorized personnel, following the confined space requirements of OSHA. Prior to entry, atmospheric monitoring shall be conducted, and an entry permit shall be completed to verify safe entry conditions. 3.9 All safety equipment, safety showers, eye wash fountains, fire extinguishers, emergency exits, and walkways must be kept clear at all times. 3.10 All project areas shall be kept clean and free of debris and rubbish in order to prevent accidents and fires. 4.1 Contractor to provide the Material Safety Data Sheet (MSDS) for hazardous chemicals use at TSG to OSHU before start any work where in which contract employees may be exposed, come in contact, or directly handle. The contractor shall inform his employees of the hazards of the chemicals. 4.2 The contractor is responsible for maintaining MSDSs for all hazardous chemicals used by the contractor or subcontractor. 4.3 When handling corrosive materials or irritants, rubber chemical gloves, goggles and/or face shields shall be used. 4.4 All compressed gas cylinders shall be secured from falling at all times and capped when not in use. 4.5 At no time shall gasoline be used as a cleaning agent. 4.6 Flammable liquids/gases and solvents shall be handled in approved safety cans with flash back arrestors and tight closing lids. 5.1 All ladders used at TSG shall be heavy duty industrial type ladders. The use of aluminium ladders for electrical work is prohibited. Ladders shall be secured at the base by safety feet or equivalent and tied off at the top when there is a chance of displacement from workplace activities or traffic. All portable ladders used to gain access to an upper landing surface shall extend at least 3 feet above the landing or secured at the top and a grasping device provided. All straight and extension ladders shall have approved safety feet and be equipped with a 10 foot by 1/2 inch rope spliced to the next to the top rung. Ladders with split or broken rails, treads, rungs, or with feet missing or otherwise damaged or considered unsafe must be removed from the job. Step ladders shall not be used as straight ladders. The height of the ladder must be sufficient to keep from working from the top of the ladder or the top three rungs of an extension ladder. The ladder shall be positioned so that the base is set out from the vertical a distance equal to one-fourth of the ladder working length. 5.2 During overhead work, ground work, or work inside a production area, all areas must be barricade , and a warning sign shall be placed on the floor. All areas involving overhead work or work inside an occupied area that poses a hazard to other personnel shall be barricade and/or warning signs placed to limit access to the area. 5.3 All excavations and trenches shall comply with the OSHA Trenching and Shoring requirements, which require guarding by a sloping system, shoring system, support system or equivalent. In addition, these areas shall be barricade and, at night, alerted with proper warning lights. 5.4.1 Each platform on all working levels of scaffolds shall be fully planked or decked between the front uprights and the guardrail supports. 5.4.2 Vertical ties/braces shall not exceed a 4:1 ratio with the minimum base width of the scaffolding. Horizontal increments for ties shall not exceed 30 feet. 5.4.3 Supported scaffold poles, legs, posts, frames and uprights shall bear on base plates, mud-sills or other adequate firm foundation. Footings shall be level, sound, rigid and capable of supporting the loaded scaffold without settling or displacement. 5.4.4 An approved ladder or equivalent safe access shall be provided on all scaffolding systems. Additional fall protection shall be required if the interval distance between the scaffolding base and the lower level is 35 feet or greater. 5.4.5 Guardrail systems consisting of a top rail, mid rail and toe-board shall be installed on all open sides and ends of supported scaffolding that is at or above a height of six (6) feet. Contractor shall install netting from toe-board up to the top of anticipated material storage height. 5.4.6 All cross bracing must be installed in accordance with the manufacturer's instructions. 5.4.7 When wire rope clips are used on suspension scaffolds, U-bolt clips shall not be used at the point of suspension for any scaffold hoist. 5.4.8 An insulated thimble shall be used to attach each suspension wire rope to its hanging support. 5.4.9 The suspension wire rope shall be covered with insulating material extending at least four (4) feet above the hoist. 5.4.10 The tail line shall be insulated to prevent contact with the platform. Each hoist shall be covered with insulated protective covers. 5.4.11 In addition to a work lead attachment required by the welding process, a grounding conductor shall be connected from the scaffold to the structure. 5.4.12 All employees shall receive training as required by OSHA scaffold standard and shall provide documentation on training per request. 5.4.13 Full body harness shall be worn with a lifeline securely attached to an appropriate anchorage. Free fall distance when using a full body harness must be limited to 6 feet or less. 5.5 Hoses, welding leads, electrical drop cords, etc. shall be kept out of personnel traffic areas when possible. Otherwise, they shall be adequately protected from damage and presenting a tripping hazard by suspension, signs, barricades and/or burying. 6.1 The Contractor shall apply PTW from TSG charge man before start any electrical work (repair and maintenance or new />installation). The Contractor Supervisor shall ensure that electrical or mechanical equipment is properly locked and tagged out before employees begin work. 6.2 All electric hand tools shall be grounded unless it is recognized by UL as having a double insulated rating. Frayed or defective electrical cords shall not be used. 6.3 All extension cords and power tools shall be used with appropriate Residual Current Device (RCD) protection that is tested regularly. 7.1 Adequate fire protection and other safety precautions must be addressed before any hot work is executed. tardant tarpaulins shall be used to shield personnel and equipment from welding operations. When welding, cutting, or burning, a standby employee shall stand as a fire watch , and all sparks must be contained to the area of operation. 7.3 The Contractor shall ensure that fire extinguishers are provided at all welding, cutting, and burning operations. 8.1 Only qualified personnel (TSG Staff) may operate the facility forklift trucks or similar material handling or earthmoving equipment.
. 8.2 Only approved personnel work platforms shall be used with forklifts or similar lifts. The platform must have standard guard rails or equivalent means of fall protection and be secured to the lift. Proper communication (visual or otherwise) must be maintained between the personnel on the platform and the lift operator at all times. The vehicle shall not be moved with the platform in the raised position. 8.3 All personnel in skyl lifts shall wear a full body harness and lifeline that is anchored to the platform cage as a means of fall protection in addition to the protection provided by the platform cage guard rails. 9.1 No hazardous or environmentally damaging materials can be poured down process or storm drains. 9.2 It is the responsibility of the Contractor to dispose of hazardous materials that are used by the Contractor (e.g., paints, solvents) during their work operations at the facility in accordance with regulatory requirements (DOE). 10.1 Contractors must provide all tools necessary to perform the assigned tasks.>br> 10.2 All tools and equipment must registered and submit one copy to OSHU before start any work at TSG or site.>br> 10.3 All tools and equipment must comply with act and regulation in Malaysia. 11.1 All contractor must submit JSA/HIRAC when requested by OSHU before start any work at TSG or site. 12.1 All contractor or and employees must attend safety briefing conducted by OSHU or JKKP before start any work.